Lets look at in 2D. 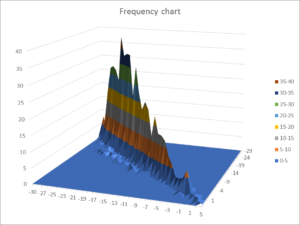 Above is a 2D chart of the same data. Note that there are 902 observations, so many of the dots account for scores of observations as can be seen in the 3D chart above. The outliers can be seen more clearly, but it isn’t so obvious that there is only a small number of them. In fact, examining the data showed that the outliers came from only one observer, and all of their observations (about 15) were outliers. There is a strong case to exclude them as anomalous. Above after stripping the 15 anomalous records, there is an obvious trend. Above, we have used Excel to add a linear trend line to the data. Remember that individual dots may account for scores of observations, all observations are used to calculate the trend line. Above is a more detailed regression result using Excel’s LINEST() function. The coefficients tell us that the slope of the curve fit is almost exactly 1 (0.9975) and so the system appears quite linear over the range tested. The intercept is -0.1684 with, it is the difference in SNR between the two transmitters and as might be expected it is fairly close to zero. Data obtained for any experiment needs careful review. 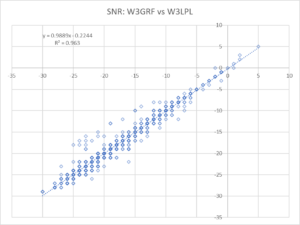 There are a host of problems which influence WSPR data quality, some inherent in the system, some related to the end stations, some in the data archive. 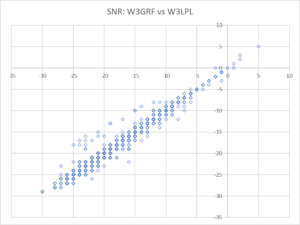 In my experience, WSPR data deserves great more attention to identify and excise anomalous records. The experiment described here assumes a single ‘spot’ record lodged by each station hearing each of the transmitters and is spoiled if there is more than a single record for each. It has been observed that there can be more than a single record (eg if a call sign was simultaneously active on more than one receiver on that frequency), and those records should be excised to improve data quality (DXplorer contains a facility to do that and an override switch). 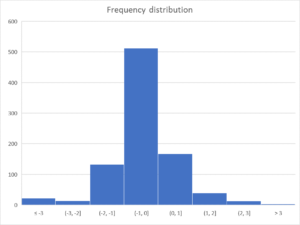 The observed SNR difference was not normally distributed and therefore unsuitable for parametric statistical analysis based on normal distribution. Careful examination of the data highlighted a very small number of outliers which were excised to improve the model quality. A linear regression is a non-parametric analysis that produced a very low error model explaining the dataset. The actual power output of each transmitter was not measured but estimated and that contributes to measured SNR difference. 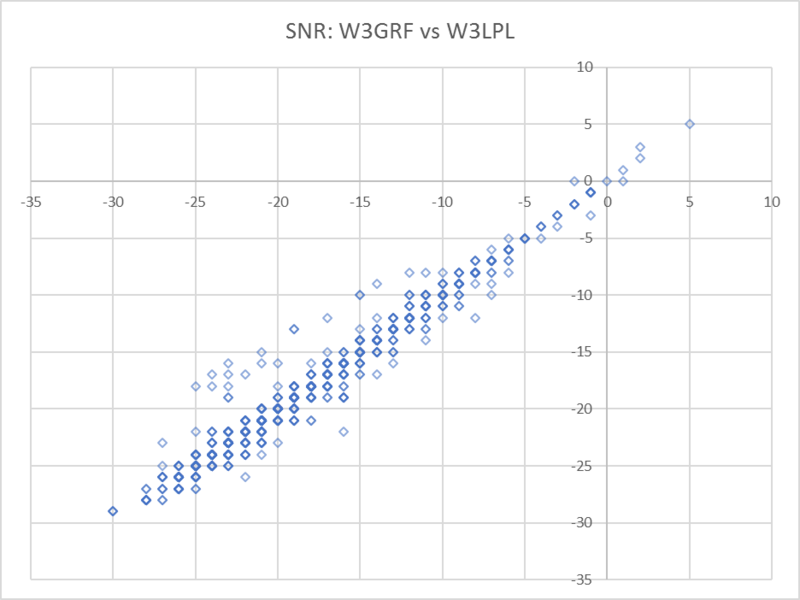 The test results were that the differences between simultaneous measurements of SNR for each transmitter at a number of observing stations was -0.24dB with standard error of 0.1dB. 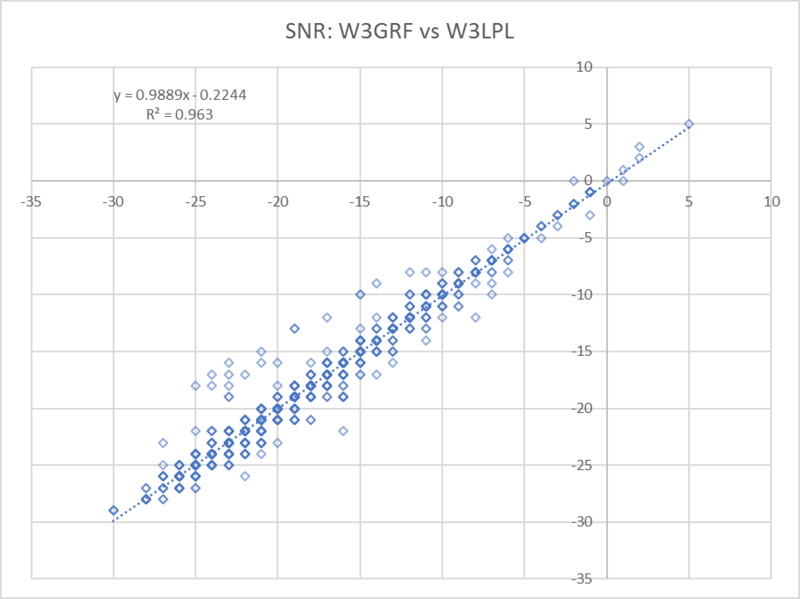 The results are quite consistent with almost equal transmitters feeding the same antenna, and suggest that the method might lend itself to comparison of two different antennas using two WSPRlites. Previous Previous post: Small untuned loop for receiving – is an amplifier necessary?